This is a great beverage, for a party, or a brunch and even if your just waking up in the morning and want something sweet, creamy and filled with healthy fruit. One sip of this drink brightens up your whole day. This drink is so refreshing, and I love, when you're just sitting by the pool, on a lounge chair, with sun glasses, and a yummy fruit sorbet smoothie in your hand. 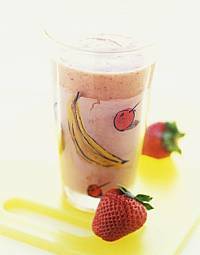 In a blender, combine yogurt, strawberries, banana, orange juice and ice cubes. Blend until all ingredients are well mixed. Then add cut up mango and cut up pineapple. Blend until smooth. Serve right away. I make this for my kids almost every single day!